And so, as winter quickly sets in, two months of research draw to a close in DOQ Priorat. During this time we’ve been based in the village of Gratallops and have gotten to know the region quite well. What a wild ride this has been. In five years of writing our enotourism guides this has been one of the most dynamic and fascinating regions to date. If you had asked us six months ago if we were ever going to write a guide for Priorat, we would have said “not really” and then, we visited it. The natural beauty and history of Priorat is simply stunning. Of course, it didn’t hurt that we visited nearly 100 cellars and tasted who knows how many hundreds of fantastic wines. But, for a region with wines ranging from seven to seven hundred euros a bottle, there’s an amazing consistency in the character of the wines. Having tasted and visited nearly all of what the region has to offer, which is quite a lot, we understand why it receives the praise that it does. So, what next? Well, first off, there are more Priorat stories to come via this little blog here, but more importantly, there will be the Vinologue Priorat Guide coming in the first few months of next year both in English and Catalan as well as digital and print. This is our most ambitious guide to date and so we can’t wait to share it with everyone. So stay tuned if you want in all the goodness! 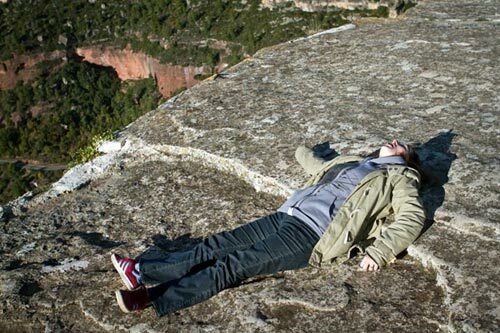 The nap above is courtesy of the dangerous cliffs that make up the amazing village of Siurana perched on a rock, which we visited on one of our last days in Priorat when the wine tasting was most definitely catching up with us.